Less than an year after his success in the election of Governor of New York began the Great Depression, the greatest economic crisis of the XXth century. Between Thursday, October 24 and Tuesday, October 29, 1929, the quotations on the stock exchange in New York collapsed. These days are known as Black Thursday (October 24), Black Monday (October 24) and Black Tuesday (October 29). These three fateful days are etched in the memory of the fellows. In mid-day Thursday, Oct. 24, the Dow Jones cotation lost 22.6% causing panic and rioting before the Stock Exchange building after the closing of the doors by the police. In the afternoon, the situation had improved by institutional investors who decided to support the market. At the end of the day, the Stock Exchange market closed with only 2.1% down. On Monday 28, the banks were unable to intervene because the number of shares offered for sale was more than 9 millions. The Dow Jones lost 13%. Tuesday 29, more than 16 million shares were exchanged causing a further decline in the Dow Jones of 12%. Between October 22 and November 13, 1929, the Dow Jones lost 39% of its value. This market crisis caused an economic crisis that lasted until the beginning of the Second World War and had repercussions up to Germany. On Thursday, October 24, 1929 is positioned at 1° 54′ of Scorpio. This degree of the day has a conjunction with the transit of Sun in House II. It has a Powerful force thanks to Sun. The degree of the year is set to 11° 01′ of Aquarius. This is the exact degree of the natal Sun (at 0° 07′ near) into House V, that of the speculation. It has a Very Powerful force with its conjunctions with the Sun and the Part of Fortune. At forty-seven years and eight months, he announces the Mars-Saturn period. Saturn has a powerful force because it is situated in the degree of the Moon in nocturnal birth. It has a Middle quality in Taurus through its conjunction to Jupiter which has a Beneficent quality. The degree of the year is conjunct with the degree of the natal Sun. It has an Evil quality in its sign of Detriment, Aquarius. Its conjunction with Venus allows us to consider that it has a Middle quality. That would be enough to make decisive losses in connection with purse into House V, that of speculation. But Saturn forms a bad aspect of square (90°) with the Sun (at 5° 05′ near), which makes it even more evil and that has the meaning of the stock market crash because it has a Very Powerful force (Sun + PF). The master of the Period is Saturn. It has a Powerful force. It has a Middle quality in Taurus thanks to its conjunction to Jupiter. The House VIII has an analogy with the greatest afflictions of life. His influence is twofold as master of the Period and because it has a square aspect to the Sun. Sun has a transit in Scorpio and has a conjunction with the degree of the day. It has a Middle quality and a Powerful force. It is also an omen of financial losses because this degree is in opposition to natal Saturn (Evil quality in Scorpio) in House II, that of money. 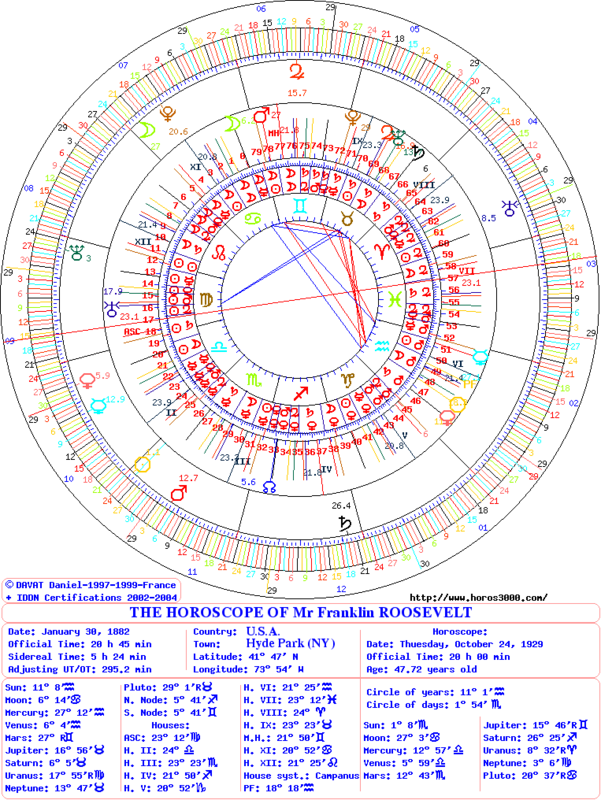 On October 24, 1929 is at 0° of Scorpio conjunct with the Part of Fortune of SR, in natal House II and House IX of SR. 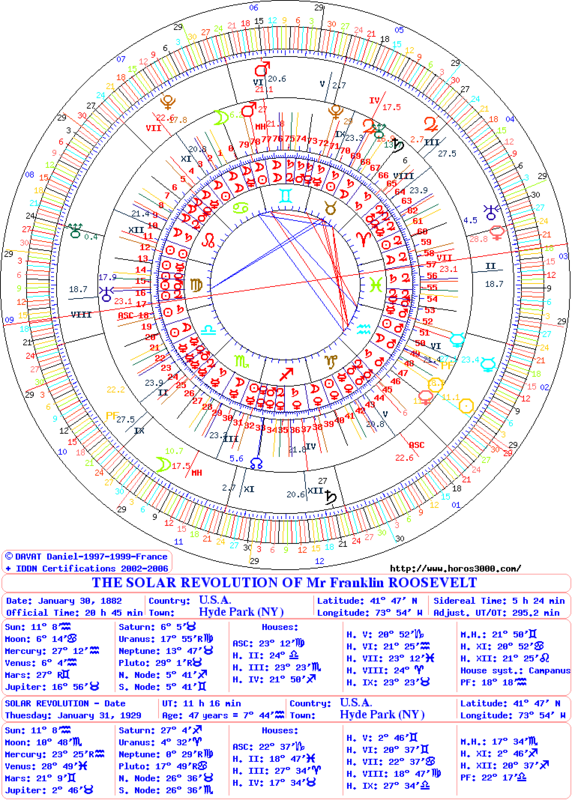 The degree of the year is at 7° 44′ of Aquarius in natal House V and into the House Ascendant of SR. The planetary period is always that of Mars-Saturn. This Solar Revolution is not catastrophic for Franklin Roosevelt. Even if he suffers a loss with stock exchange, he obtained the responsability of Governor of New York. It is a protected period because the degree of the year is also conjunct with the natal Part of Fortune. This entry was posted on Friday, February 21st, 2014 at 6:21 pmand is filed under Finances, Franklin Roosevelt. Both comments and pings are currently closed.